This was very first time that I have prepared this Thai classic and after tasting it I felt really sorry for people with nut allergies, they are deprived of such an incredible dish. Few days ago I bought a bunch of lemon grass knowing that I will use it with a chicken. Then, I was asked to get some peanut butter for breakfast and suddenly I remember reading a recipe that used chicken, lemon grass and peanut butter: the famous Peanut Butter Chicken Satay. The marinade is quite easy to prepare if you have a mini chopper (one of the most useful tools in kitchen). The marinade can be made day or two ahead and stored in fridge. I served this with cellophane noodles tossed with mixture of fish sauce, honey, lime juice and sesame oil. Taste-test the marinade - you will taste sweet, spicy, and salty. 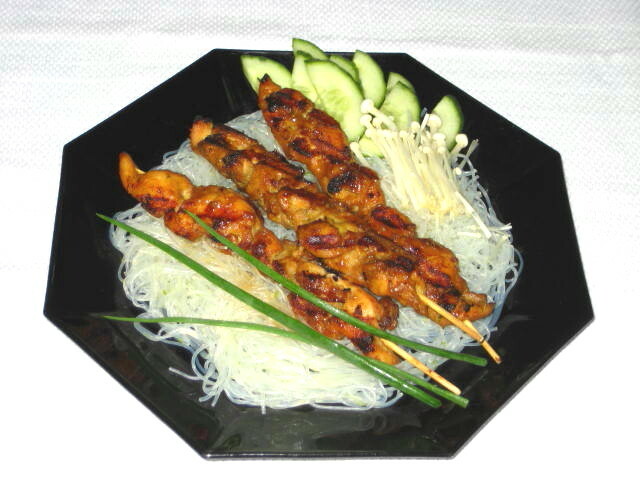 The strongest tastes should be sweet and salty in order for the finished satay to taste its best. Add more sugar or more fish sauce (in place of salt) to adjust the taste. You can also add more chili if you want it spicier. 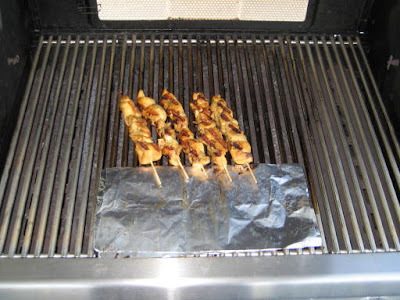 When ready to cook, thread meat onto the skewers, stopping about 3” from end. Grill the satay on your BBQ, or on an indoor grill, basting the chicken each time you turn the skewers. Depending on how thin your meat is, the satay should cook in 5 to 10 minutes. Do not over cook! Serve with rice, rice noodles or cellophane noodles and a bowl of Satay Peanut Sauce for dipping.